I’d like to share the Pxleyes website (“For Pixel Addicts”) with you, a graphics community site that invites you to participate in Photoshop/Photography/3D contests. It helped me a lot when I was first learning Photoshop by giving me the motivation to create something and share it with the Pxleyes community. Your uploads are posted on the contest wall and other artists critque your work. Seeing what others have created, starting with the same picture, is very inspirational. Most artists upload step by step guides of their work as well. Going through these step by step guides, acts like a tutorial to help you learn new techniques. 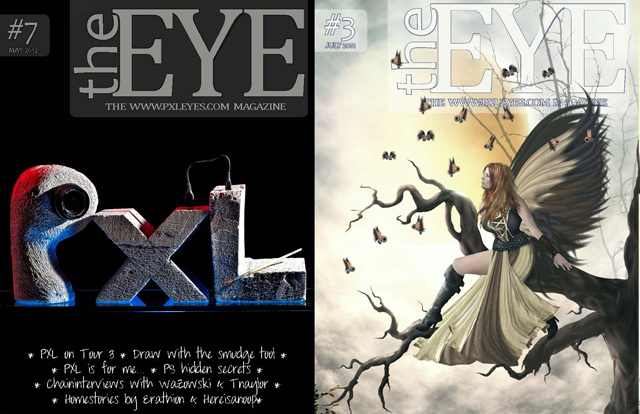 Pxleyes also has a magazine, called The Eye, which you can view onliine or download – check it out! The Behance Network, an online portfolio platform, for the first time ever, are organizing Portfolio Review Events around the world. From May 14-21, as part of their mandate, they are supporting in-person critiques. 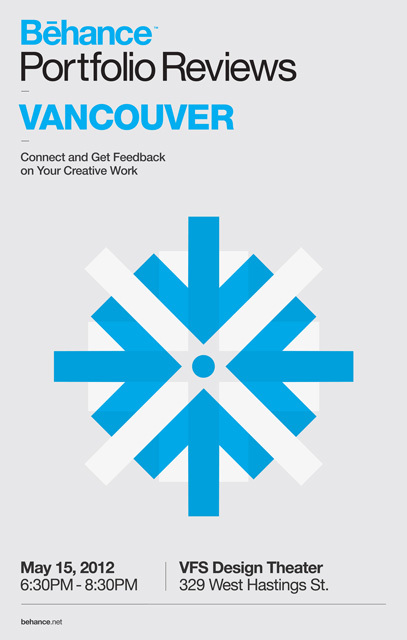 And VFS Digital Design is hosting one of these events on Tuesday, May 15, 2012 in the Design Theatre at 420 Homer, Vancouver. I first came across the event while I was on Twitter one day. I found a notice that invited people to organize their own event. So, I got in touch with the moderator from Behance and with Digital Design’s Program Manager, Sholeh Atash, and I’m excited and grateful that everything got approved. It’s a great opportunity to meet with people from within the industry and network yourself. Plus, Behance will be giving away 3 months of free ProSite (the customizable portfolio website on the Behance network) to anyone coming to the event! For those of you who are looking for new ways of entertainment, Google Play is your one stop shop! You can have access to books, movies, musics, games and a lot of other apps. It was was formerly known as Android Market. Google Play claims that there are more than 450,000 movies, books and apps available for downloading to your desktop or Android phones. It’s certainly an interesting resource for tracking the historical development of design in Canada. And it showcases a great diversity of illustrations, videos, graphics, and digital design examples. Humans are flawed and bosses are humans and therefore, plenty of bosses are flawed. The bad news, of course, is that there is little to nothing you can do to rid yourself of a bad boss in the short term except look for a new job. You can also sometimes — sometimes — outmaneuver and/or outlast a bad boss. But really, your energy is better spent learning to deal with the difficult people. While there are some people who operate in genuinely bad faith, most bosses are doing their best, just like you are. But the first step to getting along is figuring out what sort of boss you’re dealing with. “I wouldn't have had the knowledge and confidence to take the job, or feel confident in my new work environment, without the guidance from my teachers and mentors at the school.